Hello Swellions! Today I am presenting to you an idea that I kinda changed last minute. I knew along that I wanted to make a cake stand, but yesterday after looking at an ejected cd in my car, I got the idea that I wanted to use a used CD as a base for adorable project. 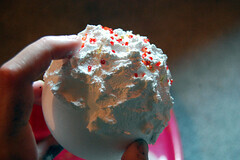 And it’s the perfect size for a cupcake (in my case, mine is faux and I’ll show you how to make them as well). So onto the show! 1. Take spray adhesive or Xyron runner and coat back of 12″ x 12″ paper. 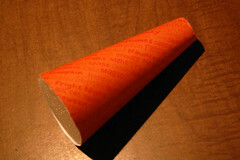 Wrap paper around cone until tight and secure. Cut off top and bottom of paper around cone. 2. Lay cd on top of adhesive on remaining 12″ x 12″ paper and trace with pencil. Cut out with scissors. 3. From the 12″ x 12″ black paper, cut out two strips 12″ long by 2″ wide. Lay side by side to form one long strip. Place tape in middle to join the two strips. 4. 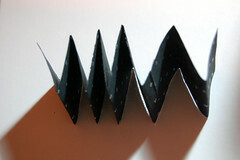 Accordian fold the strips back and forth in approximately 1.5″ segments. 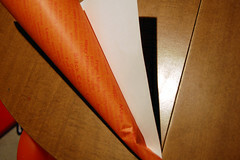 When finished, cut diagonally on both sides 1/8″ down from top of folded strip. Unfold to reveal pennant banner design. 5. 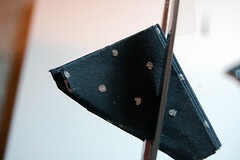 Carefully glue gun pennant banner around side of CD, and cut off and glue any excess that overlaps. 6. Use glue gun to glue top of styrofoam cone to bottom of CD. 7. Embellish bottom of stand with black and silver self-adhesive rhinestones, and dot in between pennant sections using orange rhinestones. 1. 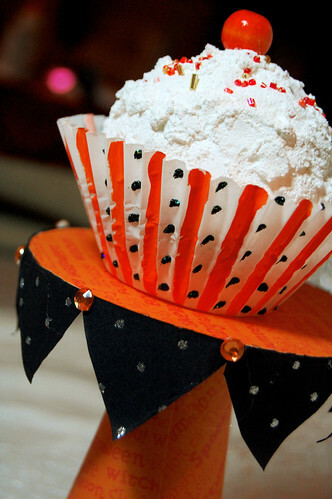 Using liner brush, paint alternating sections fo the cupcake holder Jack O’ Lantern Orange. Let dry. 2. 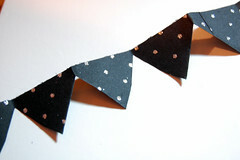 Use Black Craft Twinkles to dot in between these alternating stripes as shown. Set aside and let dry. 3. 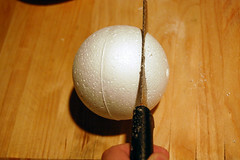 Cut off the bottom of the foam ball to create a flat surface using kitchen knife or styrofoam cutter. 4. Add a few drops of water to your bottle of Snow-Tex paint. 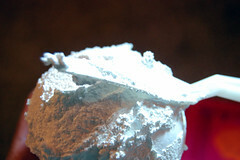 This will give it a creamier consistency for your “frosting”. Frost your cupcake everywhere except for the bottom. While wet sprinkle on beads and gently press into place. Also place wooden ball into place into this wet paint. Sprinkle on Glamour Dust as well over top. Let dry. Your creativity constantly blows me away! This is spectacular-I love it! I’ll be linking to it in my next Halloween Roundup. Wow. That is really cool. I love it. You’re so crafty! This is adorable!! 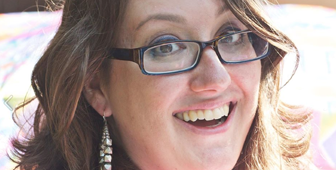 Thanks for adding my blog party invite to your site:-) I love meeting new creative people. I just found your blog and wanted to let you know I love your craft projects! Would you mind if I did a post about them and put a link back to you? I think more people need to see your blog. So excited I found this! 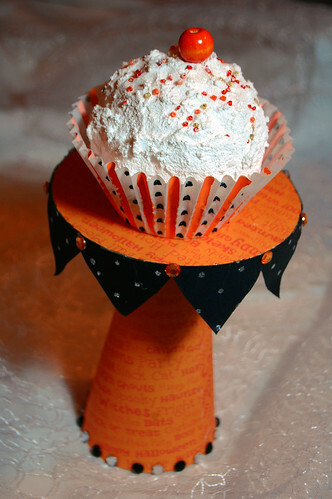 I am putting together a bridal shower and wanted individual cupcake stands for each guest. I would need about 30. Unfortunately my budget wouldn’t allow me to purchase 30 cupcake stands (especially for a one time event) but now I am going to make them!! I’ll send you a pic after I get some put together. WAHOO Thanks!! Alexa, you’re my new bf! 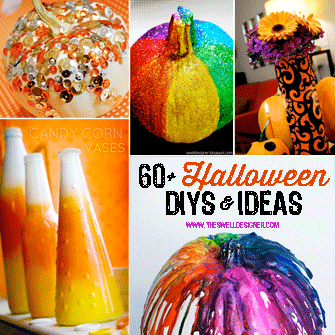 I love Halloween and all your ideas! Great show on MCC!